To celebrate African American History Month, I’m going to feature black artists the month of February. Naturally I’m going to start with one of my favorites, Horace Pippin. One of the most interesting phenomena when studying African American art, I think, is the period known as the Harlem Renaissance. After World War I (1914-1918) large numbers of African Americans moved from the South to cities in the North looking for better opportunities. Many settled in large communities in cities such as New York, Chicago, and Philadelphia. In the 1920s a large number of artists came together in these cohesive African American communities, something that could not have happened in the rural South. Exposed to museums, libraries, and art collections, African Americans explored their heritage, and this fomented a flourishing in African American art. Pippin grew up in rural New York and became interested in drawing and painting at an early age. He taught himself to draw and paint while holding odd-jobs to support himself. As a self-taught artist, he was not influenced by established mainstream American artists. He was interested in subjects concerning the black community. In World War I Pippin was seriously injured in the right arm. His early paintings depicted scenes of the horrors of the war. By the 1930s, he returned to subject matter that reflected everyday African American life. He felt confident enough in his paintings by the late 1930s to start selling them. His work attracted the attention of illustrator N.C. Wyeth (1882-1945, father of painter Andrew Wyeth). This led to a one-person show in Westchester, New YorkChester county art critic). In 1938 Pippin’s work was included in a show on naïve art at the Museum of Modern Art. After that show he gained nationwide attention. A Newsweek critic compared his work favorably to that of French naïve artist Henri Rousseau (1844-1910). 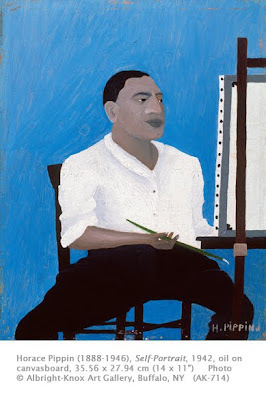 (the Philadelphia Museum of Art has a portrait by Pippin of a Pippin’s paintings were represented by a gallery in Philadelphia with great success, making him one of the first African American artists to establish himself commercially. In his Self-Portrait Pippin places himself within a great tradition in western art. He joins the likes of Judith Leyster, Rembrandt, and van Gogh, depicting himself at the easel. This beautifully simple portrait shows Pippin’s pride in his chosen vocation, while revealing the essence of his mature style: flat planes of color, even lighting, and flattened space and form. Pippin always felt that artists did not need to learn too much about technique, but rather to paint what they felt in their heart. His earnest, dignified depictions of African American life are a tribute to the triumph of the African American spirit coming out of the Harlem Renaissance. Pippin is one of our greatest folk artists. His one-man show at the Met some years ago ("I Tell My Heart") proved to me that his works were more powerful than alot of academic art. A remarkable story. Thanks for posting it.